This is my homemade box for my doll size Isidore Tarot. 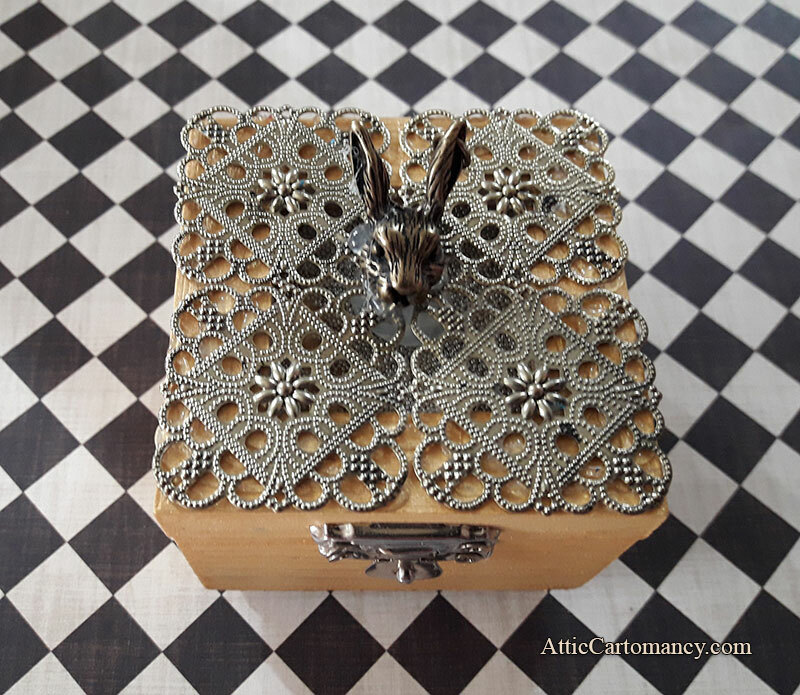 The box is about 2.75 x 2.75 inches in size, painted in gold metallic, with my favorite rabbit talisman on top. I’ll be making a few more of these, in various colors, to sell with my wee size tarot. 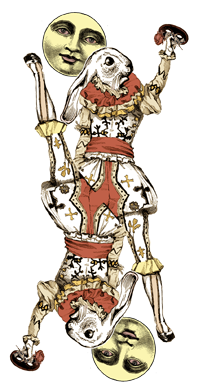 I like the queen of cups. She’s the type of woman I’d like to see myself as. She’s emotionally secure and has a warm heart. You will find no one more compassionate. She probably doesn’t spend a lot of time re-living a particular moment with a family member who said something that–after a little thought–might have been bad. She’s beyond that kind of thing; this is why I have a little ways to go to truly channel this fine lady. Like the surface of the water she represents, the queen of cups is able to act as a reflection of those things deep inside of us. She thinks with compassion, empathy, and speaks straight from the heart. When she offers advice it comes from a place of experience. She’s a creative lass as well, and I am all about the arty types. This is not a bad card to draw, though in the wrong position or moment, she can be a suggestion that things are not necessarily all good emotionally. If you draw this card take a moment to look inward and then to those around you and evaluate the nature of those relationships. With the Isidore Tarot (pictured here) I went a little more my way than the RWS version. 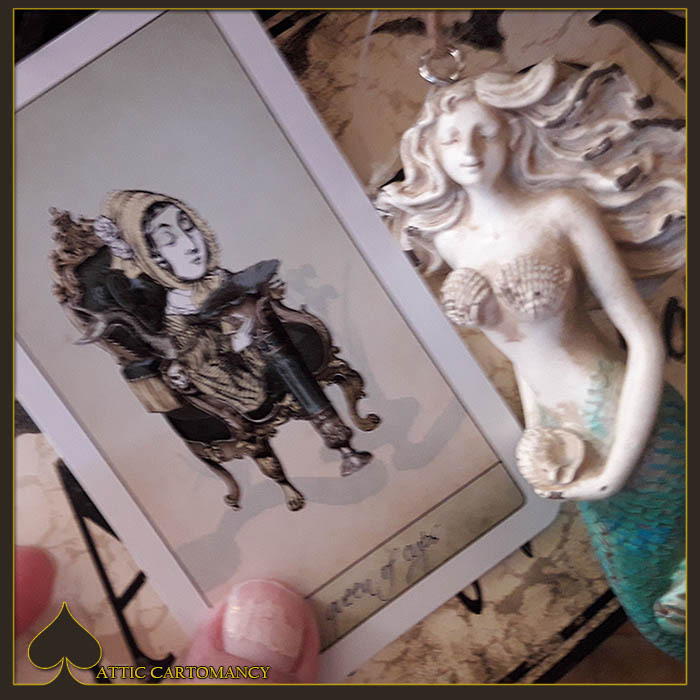 My queen of cups reflects my love of mermaids. I love water and have been known to say I’m a reincarnated mermaid, so it seemed fitting to make my water queen one. (I think I said the same thing for my knight of cups.) I wanted her to have a sense of calm and inner reflection as she sits on her comfortable throne on her wave of water. I love custom boxes. 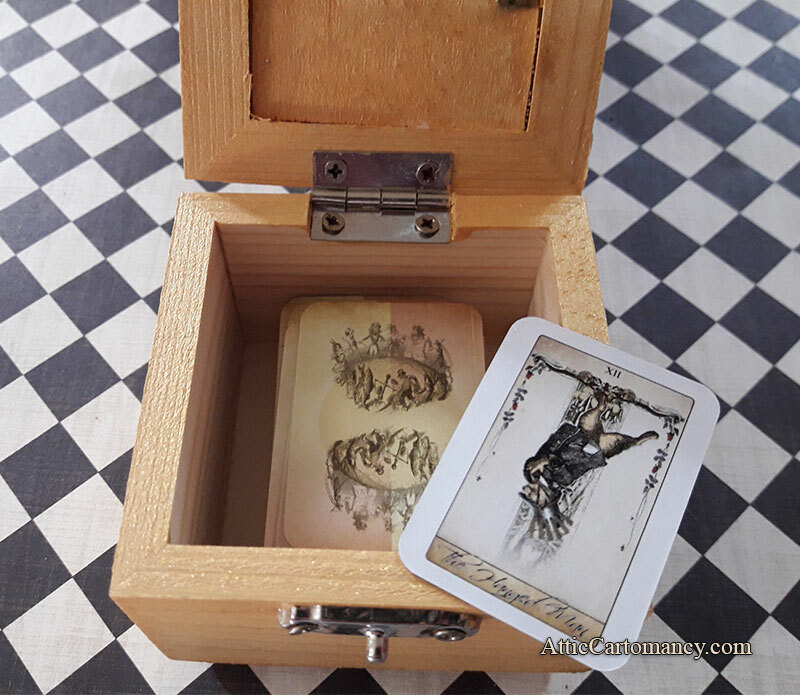 The first Sepia decks I sold all came in custom boxes I made, seen here. 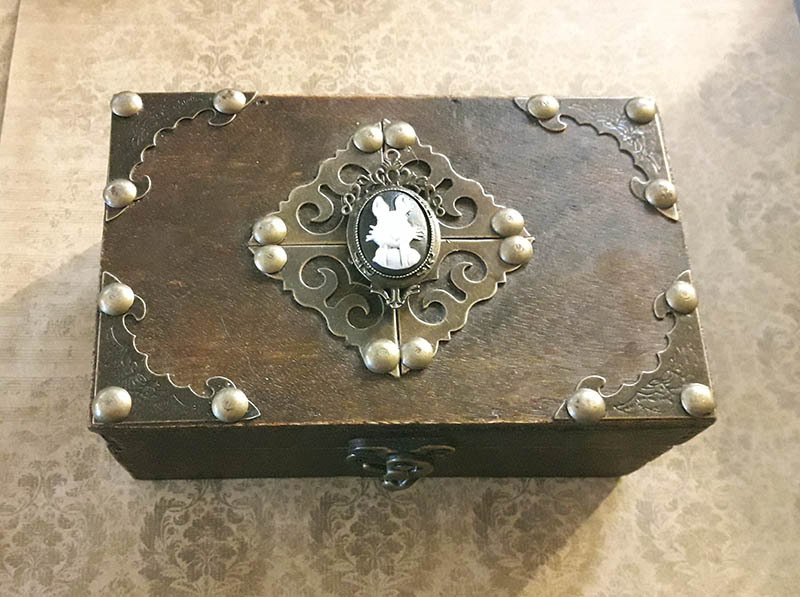 I found a box at Hobby Lobby last year that I really liked and after some modifications, it became home to my own Sepia deck. I tried as best I could to replicate it for this box. 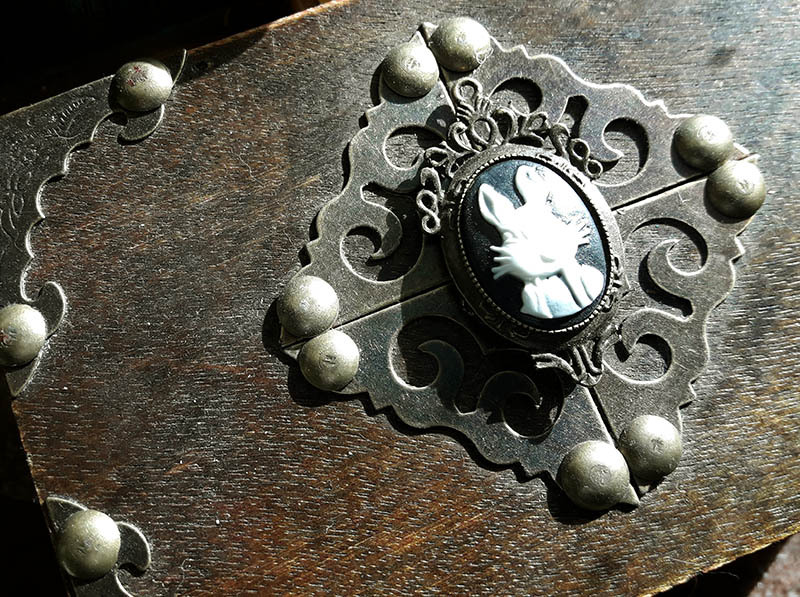 As an obnoxious fan of the book Watership Down, a lot of my boxes are bunny-centric. Hit the more button to see large size samples of the box. This one is available. Ordering options beyond the cut. 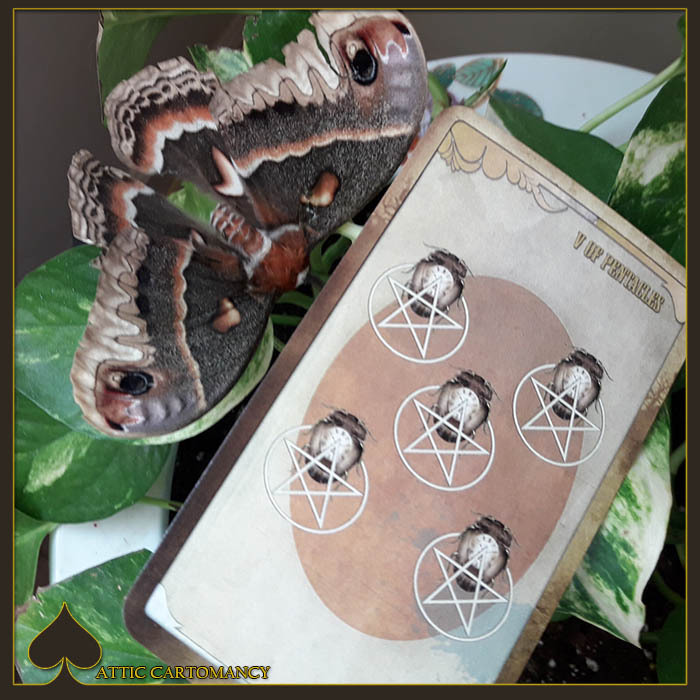 The five of pentacles is one of those cards, I’ve come to learn, that suggests very different stories depending on whether it lands upright or reversed. Upwards it deals with a financial strife or loss and all the things that come along with such a thing. Given how much value our society puts on having wealth, the loss of such wealth can affect someone in a number of negative ways beyond being a bit poorer. Far too often many of us place our self worth on what material goods we have, how nice our house is, or how different the rich often get treated next to the poor. We might spend much of our lives excessively devoted to making more money and moving up the financial ladder. How many relationships ultimately implode because the couples stress so much over their income and bills? Money or lack of it is one of the biggest sources of anxiety for many of us. This card should make you take a moment to think about what your relationship with money is and how that affects how you conduct yourself. Would a financial loss be more than just a lightening of your wallet? Or would it be a stab at your self esteem? It’s not all about money though. It can suggest something much more personal. Do you feel alone? Do you feel set aside from those around you? Are you needing someone to reach out and comfort you back into the fold? Or are you just feeling run down or drained? Are you looking out into the world and missing something potentially great in front of you because you’re too focused on something else? How would I relate this to myself? (As I try to do when I pull cards and think on them.) I was fortunate that my insurance covered a great deal of the big issues with my fall this past autumn. I’m not sure what we would have done if I needed to cover the bill just for my face/eye surgery. So for that I feel blessed. That aside, there were many small bills that needed to be covered that threw our budget out of whack. There was downtime from my shoppe that took out a good deal of my income between the gent and I. We don’t only cover our household either; my aunt has always looked out for me over the years and now that she’s needed help we’ve been helping with certain bills for her. We fell into a bit of a hole as I recovered and I felt guilty for it. Aside from the financial burdens, I felt alone. Back home in Michigan I would have had the benefit of my family popping in and out as I mended and my aunt would have been there for me around the clock. Here in Ohio I get a bit isolated during the day with my car in the shop. My gent commutes to work at dawn and doesn’t get home till dusk. My conversations tend to be with the cats and plants. It felt worse while I healed though because it seemed much of our interactions with my gent’s family disappeared as their lives went on. Autumn was a mess of difficulties and set backs. This card acts as a reminder to that. But as I said, there are two sides to this coin. Despite the set back, the new year slipped in and things started to look up. 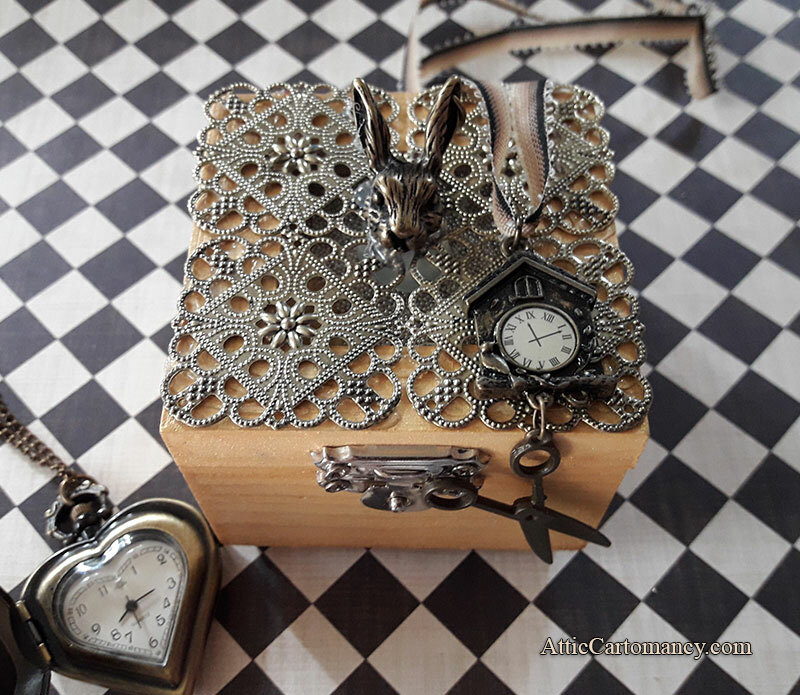 I have most of my strength back and the ability to devote my time and attentions to my projects and shop. I was able to create two new sides of my Isidore tarot and offer them to the world. My car is one new battery away from making me mobile during day time hours again. I can get back to my Y water aerobics group and talk to someone other than my fluff balls. I can help my aunt out again and only have it make our budget tight for the moment, not in the red as before. In other words, life s feeling a bit better these days. A good reminder of how it took a turn for awhile goes a long way in being reminded of one’s blessings. What? Even More New Isidore? So just after previewing the third edition of this beloved deck of mine, I have another version to throw out there? Ah’yup. I’m about to do the first pre-order from the third edition and it’s just a hiccup behind the special edition I’m going to offer for spring. I want to make sure potential deck adopters can see them both. 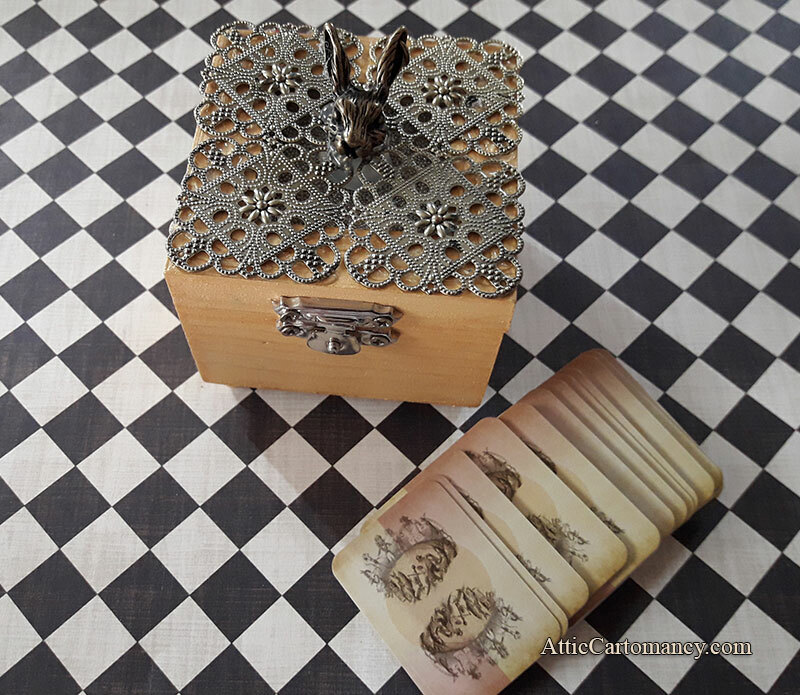 The autumn special edition of the deck is special packaging and an alternative deck back. With the spring special edition I’ve been planning I wanted the whole color scheme to be turned around. I wanted to take the rose and gold of the third edition and make it more sand and water. Thus we get the Sand and Sea Spring Edition of the Isidore deck. All the original red hues have been changed into a water palate of blues and teals. The golds are either a bit more subdued to a sandy color or brightened up a bit like the sun is shining down. I find (let me set my humbleness to the side) the major arcana turned out just beautiful. The beautiful thing about matching gold/sandy colors is they work really well with an opposite but vivid color. This is harder to do with the minor arcana simply because the suits are color coded to match the elements they represent. To get around this I tried to make certain related colors more pronounced. The third edition pre-sale starts the 23rd of January and this special edition will be right behind it on the 26th. So now that I’ve tucked the second edition of the Isidore Tarot away, it’s time to have a preview of the brand spanking new third edition. Below is a link to a preview of the new deck. The modifications to the deck are minor and yet still quite different from the previous versions. The biggest change is the removal of the white borders. The card artwork is now full bleed. My personal preference is full bleed card artwork without the borders. For me–I don’t know if it’s a graphic artist quirk or just my eye–I don’t care for borders. I like the artwork to be colorful and to be all that is viewed within the space allowed. My first deck lacks borders. And even though the artwork is not a full picture style, I like the continuation of the background design to the edges. Not everyone prefers this though. So with my second deck I offered decorative borders. With the Isidore deck I kept a standard white border around the artwork. When I found (in reviews) that some deck adopters were cutting off the white edges, I had to spend a little more time researching what is popular and why people have their preferences. My preview deck has been ordered and is on route to me. The digital preview is incredibly nice, but I’ll be able to better judge when I have the actual deck in hand. I’ve had so many requests for a borderless version though that this edition seemed very important, especially when I still have previous editions I can offer if need be. More to come! Welcome 2018! Please be a better year! !